A man’s imagination is his friend when it is a means of furthering his deepest desire: to like the world, and it is his foe when he uses it to falsify, degrade, or dislike the world for the purpose of glorifying himself. I’m grateful to Eli Siegel and Aesthetic Realism for teaching me this, enabling me to change from a dull, suspicious person, to a man with a life of eager interest, honest pleasure and self-respect. What is imagination? One of the answers to that question is: imagination is that which changes the world in order to see better what it is…The other is what changes the world in order to make us better able to live without it; that is bad imagination. To want to “see better what [the world] is,” is part of our most fundamental purpose: to like the world. To want to be “better able to live without it” comes from the hope to have contempt. Growing up, I did both. When my Fourth Grade class went on a tour of the big Main Post Office in Yonkers, I stood in awe as a postal worker showed us mail coming in on trucks, then streaming through a canceling machine at lightning speed; clerks reading addresses on letters and sorting them into compartments of big cases–each representing a different part of the U.S.–and as he explained these letters were then put into corresponding sacks and sent to those places, where they would be sorted again—first by city, then by zone, then street, house, and delivered! Into our minds came the picture of something beautifully structured; having, in a sense, a life of its own—the postal system—expanding and contracting, mingling and separating, personal and impersonal, far-flung and immediate. I think that here my imagination was in behalf of something good because, as I pictured all these things occurring, it was in order to see them accurately, and this is why I felt proud. One of the earliest and most frequent things that can happen to a human mind is to see the world as inimical. The world is a constant partner of every one of us. We are compelled to have pictures of it…Yet it is likely that the object with which, in some way, we are compelled to join ourselves is disliked or feared by us because we feel that giving everything the object has to it, will interfere with our own comfort, prerogative, importance. I did see the world as inimical and as something I should evade. As the fourth and youngest child in a pretty tumultuous family, I felt other people with their problems and confusions were an interference with my own “comfort, prerogative, importance,”—and I deeply held myself apart. At the same time, I used the sizable praise I got for being “well-behaved” to imagine I had almost a holy kind of goodness that simply did people good to be around me. When, as an altar boy at Saint Anthony’s Church, I genuflected, bowed my head, rang the bells or swung the incense, I imagined people getting inspiration not so much from a divine source as from me. Other people—schoolmates, for example–who didn’t seem to recognize my special qualities, I saw as unkind. Here my imagination was my foe because I was so bent on this false picture of myself and others, it made me lonely and nervous—it also made me mean. I remember hoping a boy who was popular had something wrong with him physically, or problems at home, or did poorly at a subject I was good in. I also daydreamed about coming out in a blaze of glory and “showing them all,” imagining myself a rock star with screaming fans, and students from my school struggling in the crowd for me to recognize them—then graciously saying hello and forgiving them. In trying to “do without” the world as it truly was, I became bored, dull-minded and painfully isolated from people and things around me. By my mid-twenties I had boxed myself into a narrow existence with few friends, few interests, and a constant feeling of shame I didn’t understand. Consultants: So, there’s some reservation. Where not? KF: Just from individuals who might not be as friendly as others. Do you think every one of the people to whom those letters are addressed is real?—is more like you than different?—and will have an emotion when he or she gets it, maybe of surprise, maybe irritation, sorrow, even joy? That night when I went to work, I had a whole different feeling about the mail. I was encouraged to study postal history, which I learned dates back to the ancient Assyrians, and have been thrilled to see how deeply it has been an expression of man’s imagination: the desire of people to receive—and also convey—a picture of what is happening in another part of the world. Words can hardly describe the pleasure and excitement I felt—and the relief!—at no longer being strapped to myself, but able to use my thought to try to see the insides of other people—in my family, among my coworkers, or in a person I met for the first time. Learning to use my imagination to know another person as she truly is enabled me to fall deeply, excitedly in love the woman who is now my wife and dear friend, Carol McCluer. This is real romance, and I’m so grateful I feel it, and that—together with our daughter, Sara—we’re studying the greatest education in the world! I had not only no friends, but was despised by all my companions…As I look back it seems to me that all hands were turned against me…I was allowed to join in no play. Ellen Reiss: Do you think there is a desire in people to be stony? Is it a way of preserving an idea of oneself? Ellen Reiss: Do you think the minute we have more feeling, we think something is running us—we aren’t running ourselves? KF: Yes. I think I feel something like that. And Ms. Reiss encouraged me to see that the answer is aesthetic: that in wanting to be affected, changed by the feelings of other people, we are using our imagination in behalf of justice and we respect ourselves. I began right away to see evidence for this—and I’m grateful to see more with every month and year. I thank Ellen Reiss for her good will; for having—and for teaching others how to have—a kind, accurate imagination. 3. The Ordinary Daydream: Friend or Foe? I was always going about with some castle in the air firmly built within my mind…For weeks, for months…from year to year…I would carry on the same tale. …I myself was of course my own hero…I was never a learned man, nor even a philosopher. But I was a very clever person, and beautiful young women used to be fond of me. A person behaves with groomed propriety outwardly; but in his bed, or in revery, or in just thinking to himself, there is another world. And these two worlds are seen as neighbors who need never meet. He describes “Julius Harris, a worker for the federal post office…of Troy, New York” who suffers from insomnia. Although Harris “likes to put on a dignified front in every situation,” Mr. Siegel writes, “there are some thoughts in himself that he has never looked at.” These include imagining himself the ruler of a large Pacific island and commanding people there; also having “the most prominently alluring females of the universe…at his beck to do what he wanted with.” The desire in Julius Harris to keep separate his everyday life “of marriage and post office” and the imaginary world within himself is the cause, Mr. Siegel explains, of his painful insomnia and also of his difficulty in writing fiction, which he’s been trying to do. The difference between the imagination of art and the imagination of everyday life is that where in art imagination serves to show the self by showing the world, imagination in “life” is used to make the self comfortable, without necessarily showing it. I had imbued myself with a thorough love of letters,–I mean the letters which are carried by the post,–and was anxious for their welfare as though they were all my own. Imagination is required to go beyond ourselves…to be fair to what we do not take to be ourselves…To watch a person in action changing, [while] being the person he was, is one of the things we should do, which is why a novel is important. We learn about people. 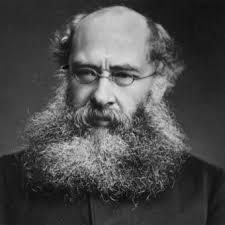 Anthony Trollope’s novels are a rich store of knowledge about people. Beginning with his Barchester series, his books were widely read throughout his lifetime because of the vividness with which he rendered his many deeply conceived and memorable characters including Mrs. Proudie, Lily Dale, and Archdeacon Grantly. ‘I don’t think you have cooked it quite enough,’ said Clara, looking into the woman’s face, half with fear, half with pity, putting, as she spoke, her pretty delicate finger down into the nasty daubed mess of parboiled flour. The desire to see the feelings of other people is the most urgent necessity for people now. It is the one thing that can lessen and end anger in marriages, the cruelty of economic injustice, racism, war. It is the imagination America must have to really be a friend to other nations and to herself. Aesthetic Realism is the education that can demonstrate to people the difference between imagination that is our friend and that which is our own worst enemy, and make a convincing, lasting case for imagination on behalf of respect for the world and people. That is why it has got to be known by everyone.